Compact bits set doesn't occupy too much space but with diversity function. The Bits seat was designed with hook in order to mount on the belt for easy carrying. Suitable for using in car, office, outdoor, narrow area and DIY repair. RWS14 is rotatable from right or left. Whole contents are made of stainless steel which has Anti-Rust and Durable features;therefore, it can be used in boat, skiing, water-motor, and yacht etc. 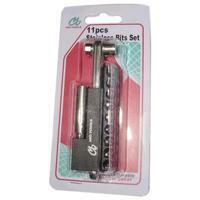 The bits and bits holder can be connected with power tools as well as pneumatic tools. All materials fulfill Environmental Protection Requirement.